The Chiefs got called with a horrible roughing the passer call to start the fourth quarter. 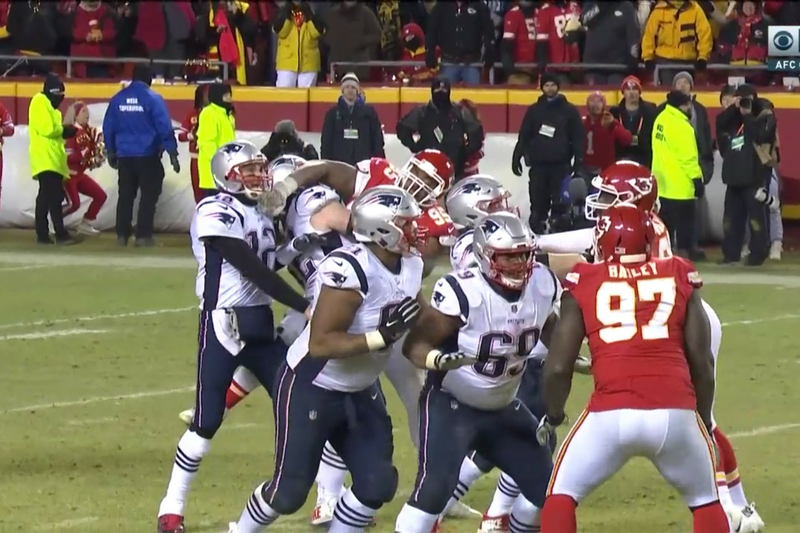 Tom Brady was getting set to throw a pass down the field when the arm of Chiefs defensive lineman Chris Jones swooped in and hit Brady in the shoulder pad. Jones was called with roughing the passer that gave the Patriots an automatic first down on the Chiefs’ side of the field. This call looked even worse considering the fact that Patriots defensive lineman Trey Flowers did the same exact thing to Patrick Mahomes halfway through the third quarter — and it correctly wasn’t called. Chiefs head coach Andy Reid was troubled by the fact that the call was made on Jones, but no flags flew when it happened to Mahomes. In this case, “play 27” refers to a no-call for roughing the passer in the video above. The call on Jones kept the Patriots drive alive and they ended up scoring a touchdown with a 10-yard run by rookie running back Sony Michel, putting them up 24-21. They eventually won the game, 37-31.